Survivors cheer the arrival of American liberators. Among those pictured are Juda Kukieda (middle), David Moszkowicz (third from the left) and Gyorgy Laszlo Spiegel (far left). 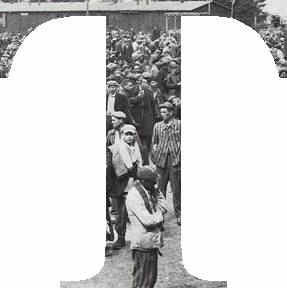 Original caption reads: "Dachau Concentration Camp. Horrors worse than those found in the German concentration camps of Buchenwald and Belsen were discovered in the stinking hell-hole of Dachau, captured by troops of the 42nd and 45th Infantry Divisions of the Seventh U.S. Army April 30, 1945. 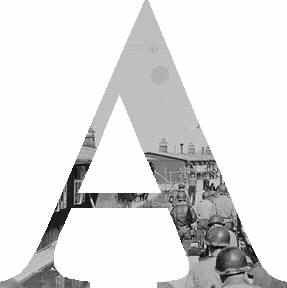 More than 32,000 prisoners were liberated, among them some Englishmen, Canadians and Americans. The camp was formally surrendered by an SS lieutenant carrying a white flag, accompanied by a Swiss Red Cross official, but SS troops opened fire as American troops approached the main entrance. The Germans were shot down. Three prisoners were electrocuted when they tried to burst through the electrified wire barrier to welcome the Americans. 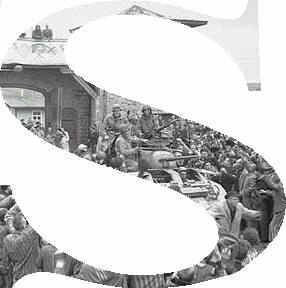 SS guards opened fire on other prisoners who went wild with joy and rushed to meet the liberating troops. 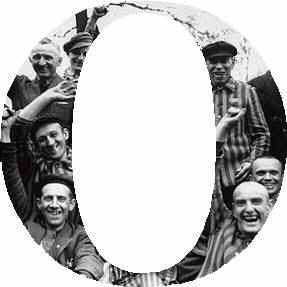 Prisoners with access to records said 9,000 people died of hunger, disease or shooting within the past three months at Dachau. Four thousand more perished during cold Winter months. When Americans entered the camp, they found 50 open railway cars standing on a siding, apparently full of dirty clothing but actually found to contain hundreds of corpses piled on top of each other. They also found a row of kennels where fierce dogs were kept to set after escaping men. They discovered gas extermination chambers, incinerators full of naked bodies, bodies marked for dissection and the bodies of several small children. This photo shows: Former prisoners of the Nazis, some wearing the characteristic striped dress of the concentration camp, wildly cheer troops of the Seventh U.S. Army following their liberation from the horrors of Dachau."